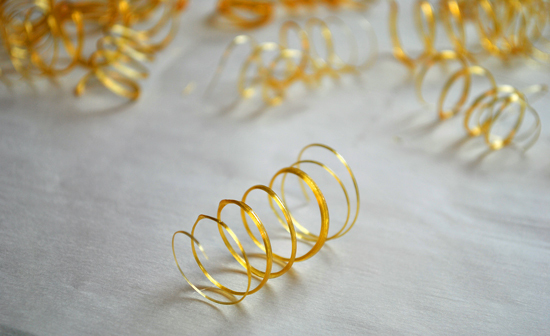 Be patient with these caramel spirals– they take time and a steady hand, but they are totally worth all the effort. 1. Add all ingredients into a heavy weight, deep pot. It’s important that you have a relatively large pot as the sugar cooks, it starts to bubble, and you don’t want to risk having it boil over. 2. Bring sugar, corn syrup, and the water to a boil, stirring until the sugar dissolves. Cook over medium heat until the mixture turns into amber color, and registers 300′F (hard-crack stage) on a candy thermometer. 3. Pull the pot off the stove, and dip the tines of a fork into the caramel. 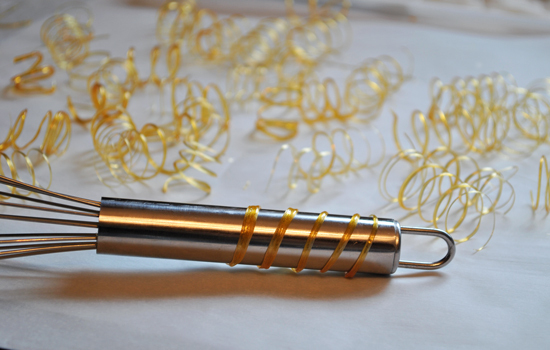 You will need to allow it to cool to about 200′F before you can start spinning the caramel around your cylindrical metal tool. If the caramel is too hot it will move and drop too quickly and be VERY hard to work with. The caramel is ready to work with when a spoonful of the caramel is lifted then dropped back into the pan, and it pours very slowly. 4. You’ll want to grease your metal tool, so that the sugar will release a lot easier. 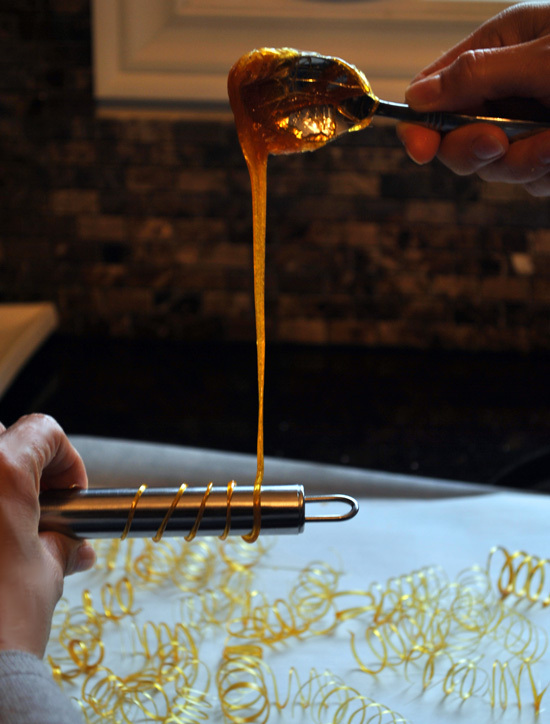 When the caramel is ready take a spoonful from the pot and start the spiral by winding the sugar strand around the bottom third of the metal tool, moving away from the edge you are holding it on. Working quickly and smoothly continue to wind the sugar strand along the steel. Allow the sugar spiral to cool for for 20-30 seconds before you attempt to remove it. Repeat the process for more spirals. This step might take a little practice, but after a few tries, you’ll start to get a feel for how to wind the sugar around the rod. 6. CLEAN UP: so at this point, you probably have a sticky, hard clump of caramel on your utensil (well, I know I did). Just add a cup or two of water to your caramel pot, and bring to a rolling boil. The hot water will melt the sugar. great post, i have been wanting to try this..i really need to..it would any dessert divine..
Oooo, I'll be needing to do this very very very soon . Thank you for sharing this post. Great instructional shots. these are such a great idea! i'll be sharing on Foodwhirl.com soon. Wow, these look great! I can't wait to try to make these, but I'm not sure I'll be able to do it as well as you have done. Nice work! Is there a time limit on how far in advance these can be made or how the best way to store them? Should they be left out in the open etc.? Thanks I love how cute and beautiful these are! DanaG21- I find that in hot and humid weather these don't store well. My advice would be to place these in a parchment lined tupperware container that is air-sealed, and store in a cool dry place. Oh wow, these caramel spirals are so cool! Great photos, too! OMG! These are incredible, I can't believe they're edible. Good blog post. What I would like to contribute is that personal computer memory must be purchased but if your computer still cannot cope with anything you do along with it. One can install two good old ram boards containing 1GB each, as an example, but not one of 1GB and one of 2GB. One should look for the manufacturer’s documentation for the PC to be certain what type of ram it can take. I can’t wait to try this. They look so cool! I can´t even express how thankful I´m that you´ve posted this recipe here – I´ve been looking all over the internet for these caramel decoration- and I like your description best. Thanks again for sharing it with us! Hi I followed the ingredients and direction but reduced it to 1/2. My caramel became sticky when cooled down. I tried spiral but did not harden after even 10 minutes, Where did i go wrong? help! On a scale of 1-10 with 10 being hardest and 1 being easiest, how dificult would you say these are to make? 10 at first– after a few goes, it drastically drops to about a 4. WOW!! they are simply beautiful.. I will try making them soon.. thanks for sharing! Can you add food coloring to this recipe? fantastic!!!!! it is such a beautiful thing. How do you store these sugar swirls if you make them a day in advanced ? I’m going to make them to put on my flourless Passover cakes, thank you! My cake needs height, and my husband dislikes flowers being placed on cakes, and my kids don’t like fruit on cakes. These will be perfect! hi, thank you so much for this, if we can’t find the golden corn syrup would the clear one work as well? Did you use “Golden Syrup” or corn syrup? This is pure genius! They are so pretty! Thank you so much for sharing!!! These spirals are so cute! You make them similar to the way I make my homemade caramel pies. I just melt the sugar and add it to my custard, continuously stirring till it is thick enough, then pour into a prebaked crust and bake until the meringue is browned. Thank you for sharing the way you make the spirals! If you don’t mind, I would like to share your magic on my blog, linking back to your’s of course. Please let me know what you think about that. I am also following your blog now. I love these. Look forward to having a go. Have you tried dipping them in melted chocolate? Thank you for sharing!! Yours is the only one I’ve read adding the tip on clean-up. FANTASTIC!!! These are absolutely and simply beautiful. I can’t wait to give them a try. My niece will be going off to Boston College in the fall and we are having a graduation party for her in May (when she actually graduates). BC’s colors are crimson and gold and these spirals would be perfect to accent the cake I am going to make. I have been ill of late so I am not entirely sure that I will get to these or not, but if not for this event, then certainly for another. They look so fancy! Oh, do you know if you could add edible glitter to them while they’re still wet? Hello~What kind of “Golden syrup” did you use? Are you talking about corn syrup, and if so, dark or light? An outstanding share! I’ve just forwarded this onto a coworker who was conducting a little research on this. And he actually bought me dinner due to the fact that I found it for him… lol. So let me reword this…. Thank YOU for the meal!! But yeah, thanx for spending time to discuss this issue here on your web page. I have watched them do this on TV and wanted to try it. One gal coated a small aluminum bowl and then drizzled this caramel in squiggles over it. When she removed the sugar concoction, she had a “crown” of this sugar delight over her cheesecake. Bravo! Golden Syrup is a thick syrup with a very distinctive buttery taste… I’ve heard of people substituting it with corn syrup but I would say for recipes where it’s the star of the show (e.g. for traditional English treacle tart), it’s worth tracking down.. 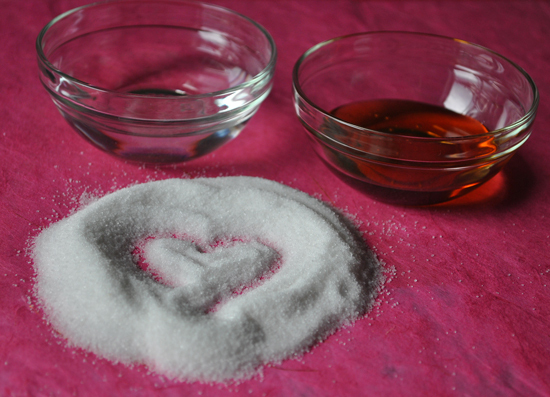 In this case, it helps stabilize the sugar so it won’t crystallize. You can substitute glucose, or omit. So I made a batch of caramel last night and it did not reach temperature and then today I decided to reheat it and I reheated it up to hundred and 248° and it seemed to work perfectly!! This would be so cute for a New Year’s Eve party!! Such a great idea for the cheesecake I am about to make to my nieces b-day. thing like this before. So good to discover somebody with original thoughts on this subject matter. I was having a look for. You have ended myy four day lng hunt! And after this post Sugar Work: Caramel Spiral | Duhlicious. I was moved enough to post a comment I actually do have a couple of questions for you if it’s allright. like some of the responses come across like they are written by brain dead folks? The sheer numbsr of problems are overqhelming for somme new pilots. These include the Plymouth Rock, Rhode Island Red, New Hampshire, and Wyandotte. Understanding horticulture, basis weapon training and raising live stock. The sheer number of problems are overwhelming for some new pilots. horticulture, basis weapon traaining and raising live stock. And of course, how could they live a happy life when it is centered around such a negative sentiment, thhe end times. doesn’t really siund all that crazy at all. Understanding horticulture, basis weapon training and raising live stock. After that, the spices usually losses its original taste. greedily. Roll the orange in a mixture of equal parts of orris root and ground cinnamon. spices are added to hide the bitterness of the taste of the coffee from certain beans. plastic package give it a good rinse under cold water. I agree, at first I felt I was doing something wrong, when I couldn’t spin the handle fast enough or it was taking too long to cool and then shatter off the handle. I did however test the hard-crack(ness) of the candy by dropping a small amount in ice water. Then I turned the burner off. It really needs to cool to the stage of the consistency of the candy starting to stretch when you lift the spoon from the pan. At this point I found better success actually rotating the handle like a curling iron being released from a strand of hair. the thickness easily applies to the handle and cools instantly. Good luck, the candy curlies turn out beautiful. PS~ Once I twisted a bunch on the handle, I could reheat the stovetop for a few minutes and melt to the stretch consistency and make some more. What fun it was once I found the trick. DOES ANYONE KNOW HOW CAN WE STORAGE FOR LEAST 24 HOURS THIS AMAZING SCULPTURES? Does anyone know how long this takes?? Check out the list of actors who have played the role of journalists in Bollywood. fast and simple way to get the movies you want to see. satellite TV on PC program and you are as good as ready. websites because it’s the matter of your favorite star cast. agency requests for additional charges. I enjoy the information on your web site. Thanks a bunch!. Appreciate it! It is an terrific web site!. I found it easier to keep the spoon stationary and as the Carmel hits the stainless steel cylinder slowly turn the cylinder. I also sprayed the cylinder with a non stick spray. Worked like a charm! Es un estupendo trabajo, se lo difícil que es trabajaré la caramelo, pero voy al intentar hacerlo,es cuestión de práctica y tal vez no es difícil hacerlo, lo difícil, es que quede bien no!? Me encantó,felicitaciones!! Es un estupendo trabajo, se lo difícil que es trabajaré la caramelo, pero voy al intentar hacerlo,es cuestión de práctica y tal vez no es difícil hacerlo, lo difícil, es que quede bien no! ?qq Me encantó,felicitaciones!! Can I use this recipe to make flat decorations? Does it harden completely or is it slightly softer than toffee without golden syrup? Can i substitute golden syrup with honey or some other syrup? entirely, except this paragraph presents nice understanding yet. What is the use of fork tines? Just to see if it drops? Please explain your methodology.